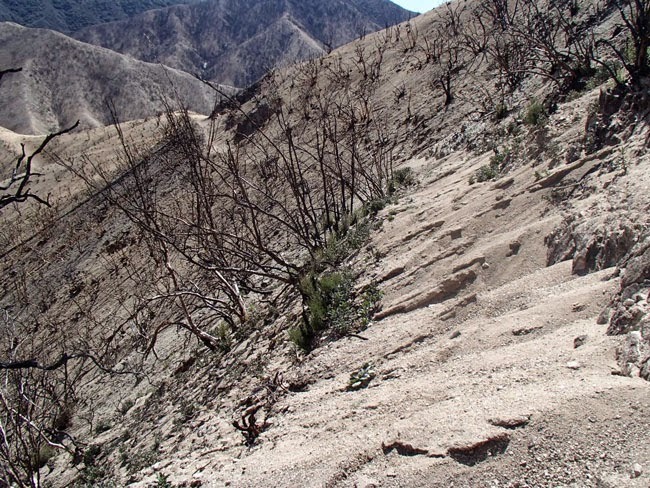 Angeles NF updated the Section E Powerhouse Fire closure to reopen the unburned Sawmill - Liebre segment, but they renewed the closure for 12 more months for the remaining area. Our SoCal PCTA rep Anitra Kass is working with ANF to determine if we can execute work projects in the burn footprint before the closure gets fully lifted (whenever that is), but it is pretty messy out there. After the area reopened last month, Pete and Jerry cleared blowdowns from the trail going up Liebre Mtn, just below Horse Camp. If anyone goes up there soon I'd be interested to hear if there are more, since the storm last week. In Section D, work continues in the Station Fire footprint. An inventory after the November 16 wind storm revealed 50 dead trees blown down across the trail, and then on December 11 the big storm went through. Pete and the Trail Gorillas will be out there next month to start clearing them.